There's been a seemingly endless parade of tiny, Linux-powered PCs entering the market in recent months, including most recently the $49 Cubieboard and the $89 UG802. It's nothing short of a revolution in computing, as I've noted before, and recently one of the earliest contenders to be announced--the Raspberry Pi-like Cotton Candy--began shipping at last after nearly a yearlong wait. To recap, the ARM-based Cotton Candy is a $199 USB-sized device that “allows users a single, secure point of access to all personal cloud services and apps through their favorite operating system, while delivering a consistent experience on any screen,” in the Norwegian project's own words. Offering a 1GHz dual-core ARM Cortex-A9 CPU, a quad-core, 1.2GHz ARM Mali-400 MP GPU, Wi-Fi, Bluetooth, and HDMI output, the device is designed to support operating systems including not just Android but also Ubuntu Linux. 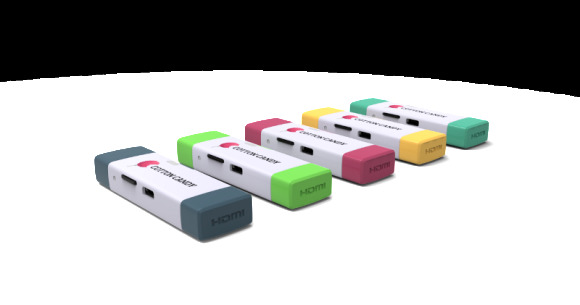 It will serve as a companion to smartphones, tablets, and notebook PC and Macs, as well as adding smart capabilities to existing displays, TVs, set-top boxes, and other media that support USB mass storage. Though shipping was originally planned for this past spring, a number of factors contributed to the delay, Ljosland explained, including a more resource-intensive route on the software side than was originally planned. The first original batch of shipments was also aborted due to a problem that was discovered in the certification process. Now, however, a developer-oriented version of the PC-on-a-stick is available, albeit with “noticeable limitations” that will be addressed in upcoming software releases, FXI says. Scandinavian registered pre-orders are apparently being fulfilled first. More details and ordering information are available on the FXI site.